Whilst winding bobbins I realised that three had surnames not just “Dear Jane” or “Betsey”. Curiosity won over housework, out came Mr Mouse, the hunt began. EMMA CONQUEST was clearly visible in painted spots, though I suspect a previous owner re-painted it. Up popped an Alfred on Manchester 1911 census, born Great Linford, Bucks, wife Emma (Abrahams), born Colmworth, Beds. Promising – alas no sign of lace. However on the 1871 census Emma (21) is a lacemaker being visited by sister Louisa, also a lace maker. On the 1861 census mother Letticcea (53), sisters Frances (18), Louiesa (16) & Letticcia (13) are lacemakers, Emma (10) is a scholar but bet she knew how to use the bobbin even then. One down two to go – dust a bit deeper. ELIZABETH SAVILLE bobbin was almost worn away through many hours of toil. Being an avid “who-dunnit” fan a soft-leaded pencil & thin paper revealed all – August 16 1863. So many could only sign a X on their wedding papers that it is no surprise that the census filler-inners wrote different versions of a name – Saville – Savil – Savall – Savell. Eventually an Elizabeth Savell, 1841, fitted. Luckily appeared as Saville on another document. Mother Mary Ann and sister Ann (15) were lacemakers living in Houghton Conquest, Ampthill, Bedfordshire. There is a death recorded as 3rd quarter 1863, aged 13 = 16 August 1863 – so maybe? Two down one to go, eyes down and stride over rubbish. MARTHA FEASEY WESTBURY spiralled teasingly round the shank. No Westbury seemed to make lace, seemed folk made lace there. So hunt the Feasey in Buckinghamshire. Plenty, but no Martha as a lacer. Eventually two likely children surfaced – one born 1842, one in 1861 – both not on further census forms. Maybe in remembrance of the first one who died aged 13 – could account for the black square-cuts and the “Kitty Fisher” header bead? Mother Sarah and aunts were lacemakers, father Thomas was a carpenter – maybe made their bobbins? Or maybe for the other one as her aunt Eliza, mother Ellen and sisters were all lacemakers? Frustrating but interesting – I will never know! Now I really must stop reading Agatha, hide the mouse, find feather duster and…. mmmm…..better idea still – use the bobbins. 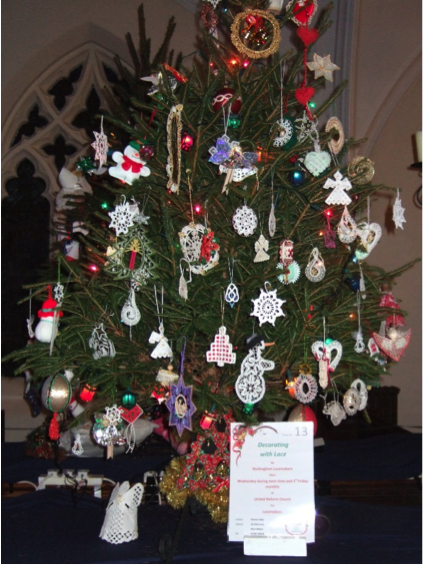 Christ Church, the parish church of Brampton Bierlow, holds a “Tree Festival” every 3 years. 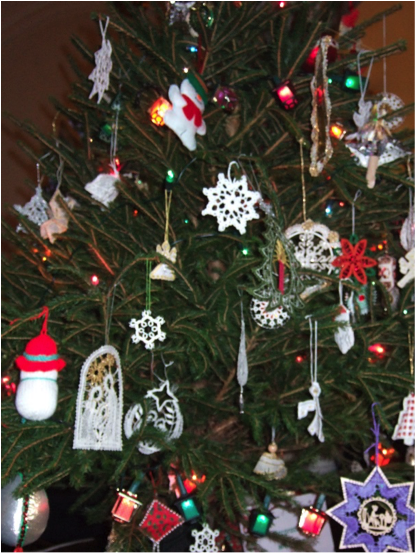 Local groups sponsor and decorate a tree. 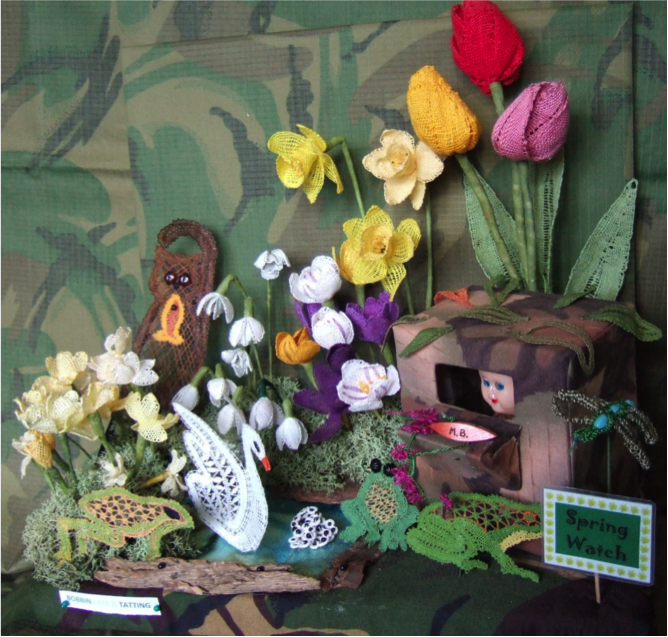 The Rockingham Craft Group searched cupboards, finished UFOs and created new ornaments in embroidery, tatting, crochet, knitting as well as a variety of laces to provide a beautiful and interesting display. One of the Lace Angels was nick-named “Kamikaze” as, no matter how we tried to attach it to the tree, it managed to fly and crash land in a nearby pew. As a new comer to the making of lace I have been surprised by the variety of styles and techniques. All of which stem from the basic whole/cloth and half stitch. I love the feel of the bobbins and found the concentration the hobby requires to be very beneficial, the history and folklore fascinating. 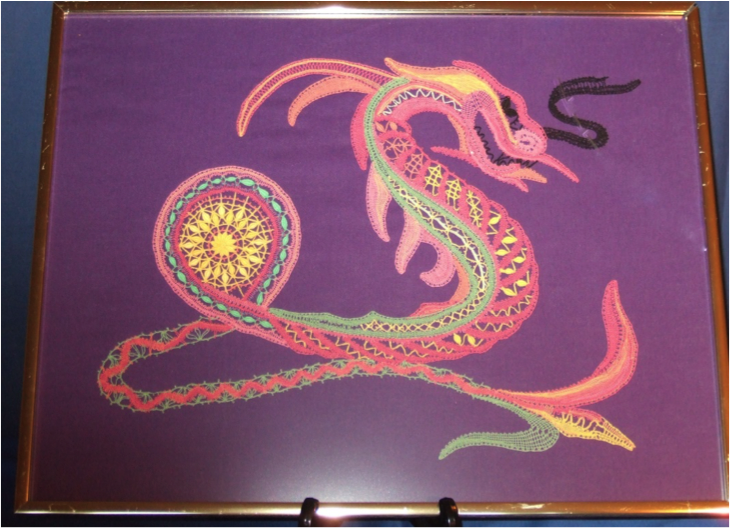 In May a group from the Rockingham Lace group attended a two day course tutored by ANNA HALIKOVA in Edinburgh. 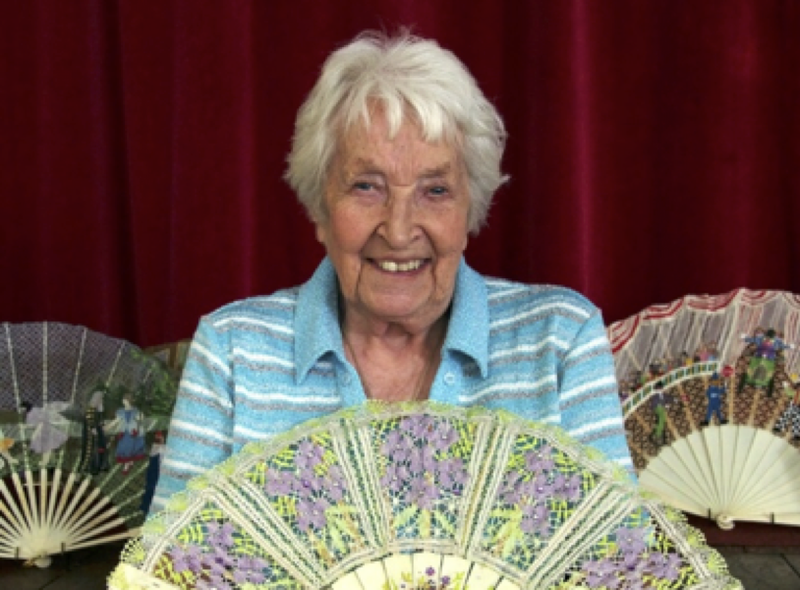 Anna teaches in her home city of Prague and for privileged lace groups in the UK. I am attracted to Czech lace by its colour and modern usage so in spite of my inexperience I was excited to be able to join the ladies. Before attending one of Anna’s courses folk are asked to choose one of a small number of possible lace pieces to ensure she brings all the necessary threads and accessories with her from the Czech Republic. Anna is a very approachable and bubbly lady. Unfazed by my inexperience Anna promptly set about finding me a project more suitable to my needs. 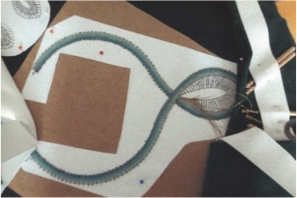 Once I got started I was delighted with the task of making my first lace necklace in a range of turquoise threads. The other ladies worked on scarf edgings or Christmas stars having previoiusly attended courses with Anna. 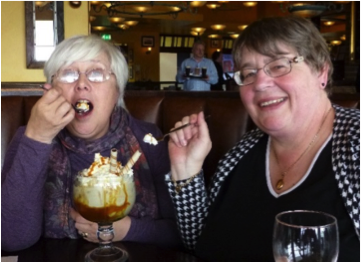 We travelled by car and stayed in a nearby self-catering apartment (with cleaning service**), wined and dined on local delivery cuisine (fish & chips) , gorged at the Quayside where we convinced the waiter that we were “calorie loading” ice cream so as to run the Marathon next day!! Sincere thanks to those ladies of Rockingham Lace for their encouragement throughout an eventful weekend, topped off by a visit to the Royal Yacht Britannia. 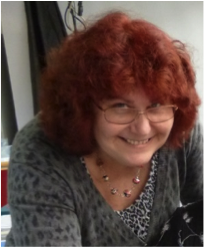 Sue W.
We meet 5 times a year (Saturday’s at 10am-4pm) at Ecclesall Parish Church Halls, Ringinglow Road, Sheffield, S11 7PP. No tuition but tutors within the group will help with a problem. 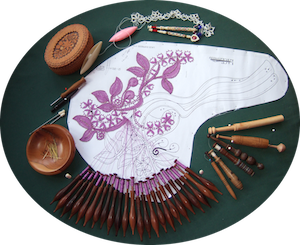 We usually work on our lace or other craft-of-the-moment, chat with kindred spirits, admire the goodies on a show table for items worked by members, appreciate the different styles of lace in progress. We have a Newsletter “PILLOW TALK” that is sent out before each meeting, raffle, committee, library, trade stall (once a year), challenge of a yearly, fun competition for completed U.F.O.s – prize “The “Munday Trophy”. Bring packed lunch or visit nearby cafes. Bring a mug – coffee & tea available for small charge.